Pea starch is polysaccharide which function as carbohydrate store and widely used in various industries such as food and beverages, feed industry, pharmaceuticals, cosmetics, textile and others. Dried peas are also used for protein and starch extraction and starch extracted from the dried peas have various functional properties which can be employed in various applications. Dried peas are one of the most versatile pulse, which can be used for various purposes. Pea starch are gluten free, natural, clean label and non GMO. Pea starch contain high amount of amylose (35%) due to which it has very high capacity to retrograde into a firm opaque gel. Furthermore, pea starch is slow digestible starch, which is proving to be a good option for obese people to control the hunger. Pea starch is tasteless, odorless white powdery carbohydrate, abundantly present in pea. There are three grades of pea starch: food grade, feed grade and industrial grade and accordingly used on the basis of suitability and demand. The food grade starch is used in the food and pharmaceutical industry, to manufacture various end products such as baked goods, meat processing, frying, and others. Pea starch is mainly used as texturizing, gelling and thickening and binding agent in various products. High starch yield output of pea is one of the prominent growth drivers for the pea starch market. 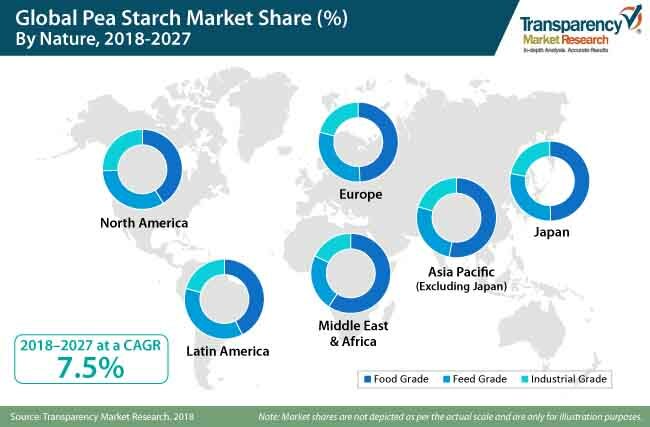 Growing consumption of convenience food, growth in bakery industry, growing textile industry are some of the major factors that are anticipated to fuel the growth of pea starch market in the near future. Furthermore, increasing health conscious population in the global food and beverage market with nutrition-rich foods and beverages, with an authentic brand commitment to quality, taste, and flavor is also contributing in the growth of pea starch market. In the global pea starch market, pea starch has gained significant applications in pharmaceutical, food processing industry, and baking industry. Pea starch are also very popular among food service providers. The aforementioned factors are influencing manufacturers to adopt pea starch, which is driving growth of the global pea starch market. The global pea starch market is segmented on the basis of source, grade, application and end use. On the basis of nature, the global pea starch market is segmented into organic and conventional pea starch. Many manufacturers are seeking to develop products with pea starch to cater the burgeoning consumer demand for nutritional and sustainable foods. They are also offering convenience and on-the-go foods with a healthy twist to satiate the millennial palates of consumers. Apart from all the above mentioned factors, the increasing awareness among population is also contributing in the growth of pea starch market. The buzz of gluten free is at the peak among health conscious customers and gluten susceptible population, which is a key reason escalating the demand of pea starch in the baked products. In the global food and beverage market, the demand of gluten free is rising abruptly and more customers are switching towards gluten free diet. According to a data from Ingredion Inc., 11 million people suffer from celiac disease and more than 70 million suffer from wheat intolerance. Pea starch is gaining the demand in gluten free baking, as baked goods with pea starch perform remarkably well to provide desired texture and structure to baked goods. Owing to this characteristics, it is proving to be replacement for the potato, corn, tapioca starch without deteriorating the quality. In addition, pea starch Pea starch provides strong, firm and sliceable gel upon cooling. It has been used to extend sliced turkey, beef burgers, chicken breast, chicken nuggets, sausages and many other meats. In textile industry, pea starch is generally used for textile sizing and especially for cotton yarns. During size mix process, starch form adhesive component due to factors such as easy de-sizing, and its properties can be tuned according to the requirement. In addition, as compared to other substitutes starch are cost effective and its chemical properties relatively similar to rayon and cotton. Global textile industry is anticipated to witness a significant growth during the forecast period, especially in emerging markets such as China and India. With the increasing demand of starch in textile industry, it can be expected theta the demand of pea starch will increase in coming years. In 2014, global textile mills market was valued at over US$ 700 Bn and anticipated to increase 1.3X during 2014–2019. In 2013, global apparel & non-apparel manufacturing market was valued at over US$ 750 Bn and is expected to increase 1.3X during 2013–2018. In 2013, China accounted for 34.8% and 38.6% of global export of textile and clothing, respectively.